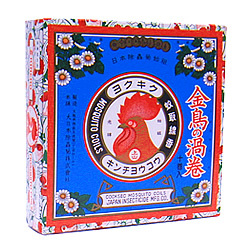 Graphic designer James Bowskill has an online scrapbook of Japanese packaging designs called "Off the Shelf." Many of the designs are actually quite old, yet they still hold up in a retro, old-is-new kind of way. This has to be the world's coolest design for a mosquito coil box.